In a greased 13x9-in. baking dish, layer half of the bread cubes, cranberries and orange peel. Repeat layers. Drizzle with butter. In a large bowl, beat the eggs, milk, 3/4 cup sugar and vanilla until blended; pour over bread mixture. Let stand for 15-30 minutes. Sprinkle with remaining sugar. Bake, uncovered, at 375° for 65-75 minutes or until a knife inserted near the center comes out clean. For sauce, in a small heavy saucepan, whisk egg yolks and sugar. Stir in cream and orange peel. Cook over low heat about 15-20 minutes or until mixture is just thick enough to coat a metal spoon and a thermometer reads at least 160°, stirring constantly but gently. Do not allow to boil. Immediately transfer to a bowl. Place bowl in an ice-water bath for a few minutes, stirring occasionally. Stir in extract. Discard orange peel. Refrigerate until chilled. 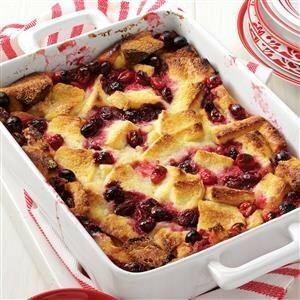 Serve with bread pudding. Makes 12 servings.